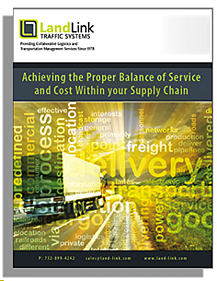 Download the Free Whitepaper: "Achieving the Proper Balance of Service and Cost Within your Supply Chain"
Too often, a shipper will focus on “cheap freight rates” and turn a blind-eye to service levels and other related cost implications that can potentially impact overall supply chain performance. Focusing solely on cheap freight rates can negatively affect the profitability and growth of the company, and while cheaper rates may look desirable, the quality of service could be sacrificed in the long run. Find out more ways to get the most value-added transportation service for a fair cost by downloading our free whitepaper, "Achieving the Proper Balance of Service and Cost Within your Supply Chain" now! Simply fill out the form to receive your free guide. Once you click on "submit", the link to view the document will appear.